The new Samsung Galaxy S III is a great phone that's just trying too hard. So hard, in fact, that it's bursting into flames under the pressure. 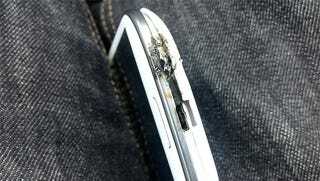 "Samsung is aware of this issue and will begin investigating as soon as we receive the specific product in question. Once the investigation is complete, we will be able to provide further details on the situation. We are committed to providing our customers with the safest products possible and are looking at this seriously."